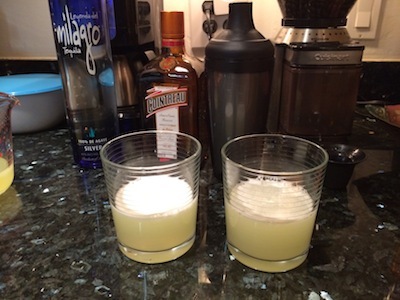 One of my favorite drinks to make at home is a margarita. Over the years I’ve tried a few different ways to make it, and I think I’ve hit upon a good recipe that gives great results. All good drinks (really all good things) start with good ingredients. For a margarita, this means using fresh lime juice, good tequila, and good orange liqueur. Fresh lime juice is pretty basic. Get some limes and squeeze out the juice. Don’t go for the pre-mixed “sweet and sour” mix. Watered-down lime-aide mixed with corn syrup shouldn’t come anywhere near your drink. 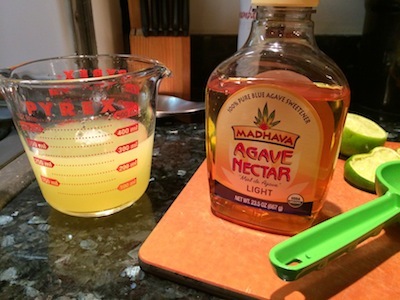 To make our own sweet-and-sour, we’ll mix in some agave nectar. Second, buy good tequila. Good tequila is 100% agave, but this doesn’t mean you have to break the bank for a bottle. For this post, I’m using Milagro Silver. While you could use a reposado, I prefer blacos (or silver) tequilas for mixed drinks. The third and final ingredient for a good margarita is orange liqueur. I normally like Patron Citronage but for this post I’m using Cointreau. First, cut your limes and squeeze then into a mixing dish. I normally get about 200ml of lime juice out of 4 medium to large limes. Next, add in some agave nectar to taste. You want to make sure that you get a nice balance of sweet and sour. For my limes, I got about 250ml of juice, so I added about 50ml of agave nectar. Now that you have the lime juice ready, it’s time to mix in the rest of the ingredients. Normally I shoot for a 4:2:1 ratio of lime juice to tequila to orange liqueur. As always, take a sip as you’re mixing to ensure it has the right balance. To mix, I first measure out the sweetened lime juice into a shaker. 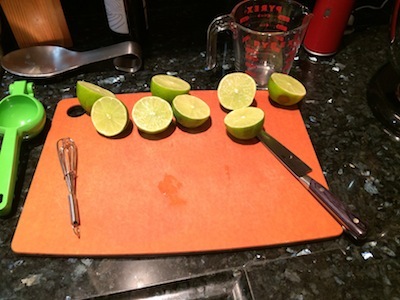 With my shaker, I start with 4 jiggers of lime juice, 2 jiggers of tequila, and one jigger of orange liqueur. 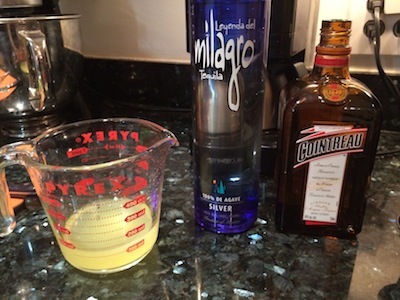 For this mix, I ended up adding a little more tequila, but, again, taste to see what the right mix is for you. Finally, add a few ice cubes to the shaker, mix it up, and strain into a couple of glasses. Enjoy!